I tend to go through sunglasses rather quickly as, I'm sure like many of you, I end up sitting on them,leaving them at a festival or lending them to someone never to be seen again. More often than not I tend to stick to Primark cheapo glasses so that I don't feel quite so disappointed when any of the aforementioned situations occur. Although the cheap £1 shades are a bargain none of the shade styles have caught my attention this year in my local Primark. So, when GlassesShop.com offered to send me some of their shades over to try I jumped at the chance! GlassesShop.com stock a huge range of prescription specs, cheap specs and generally just some lovely cheap and cheerful sunglasses for all your summer day needs! 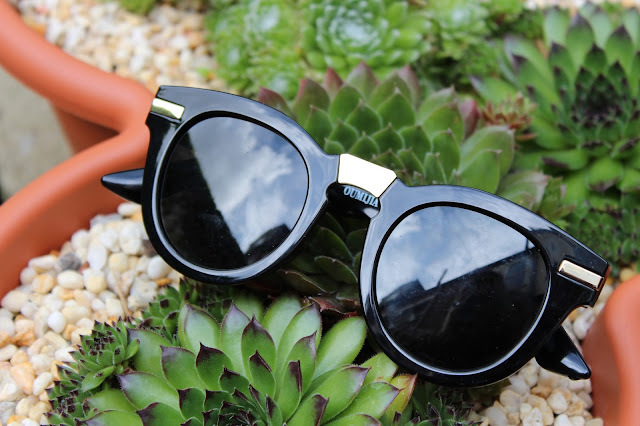 I chose the Champigny round glasses in black as I think they look rather retro and similar to these Gucci sunglasses I like but a whole lot cheaper.. These sunnies are $35.95 from GlassesShop.com. I like the shape and the bit that sits across my nose is really comfortable. You can also get them in a tortoise shell style too. 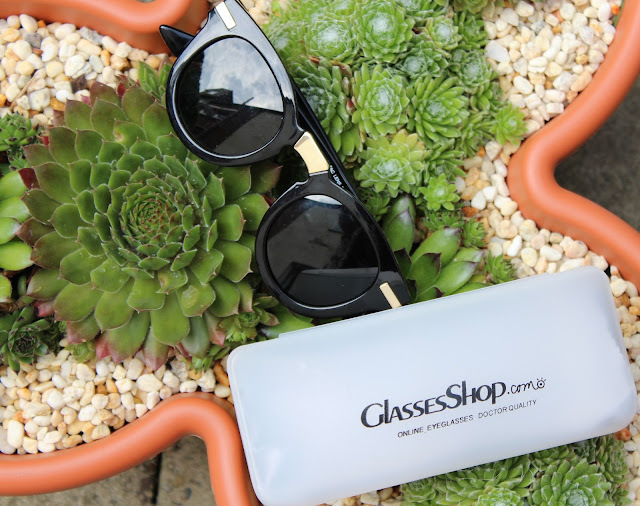 They also stock some lovely prescription sunglasses too that I'd like to get my hands on- I sometimes struggle with normal shades as it means I always have to pop my contact lenses in to wear them- much prefer just wearing my contact lenses on weekends if I can. GlassesShop.com at the moment t are running a first pair free offer!If you don't get shopping in time to catch the first pair free offer you can get also get 50% off your first order from GlassesShop.com by using a promo code they have put together for me- GSHOT50- this code covers sunglasses and specs (excluding sale frames). All I need now is a bit of sun eh! Cannot wait to get our holiday booked in the next few weeks.. we are leaving it right until the last minute so hoping for a good deal and some lovely sunshine. I'm sure I'll be posting a lot of photos of me in these sunnies soon!